A loaf of Raisin Soda Bread with a hot cup of tea is one of life's little pleasures. Now, a soda bread can be many things. In its most basic form it contains only four ingredients; flour, salt, baking soda, and buttermilk. Yet it can be transformed into this lovely golden brown Raisin Soda Bread simply by adding a little sugar, plump dark raisins, and butter. This non yeast bread has a soft and crumbly texture and is absolutely perfect when sliced and spread with butter. As I mentioned above, soda bread contains flour, salt, baking soda, and buttermilk. It doesn't use yeast to get its rise, instead the rise comes from baking soda (bicarbonate of soda) reacting with an acid (in this case soured milk or buttermilk). This makes it a 'quick' bread that can be made in under 15 minutes and you can be enjoying a slice in under an hour. The important thing to remember is to have a quick light hand for both mixing and kneading of the dough. This will give you a bread that is dense, but not doughy, with a tender, slightly moist interior. Once the dough is formed into a round, a cross is cut on the top of the bread, dividing it into quarters (called farls). Irish Soda Bread contains buttermilk which has a nice thick creamy texture with a rich tangy buttery taste that makes this bread tender. Whereas in the past it was the liquid left over after churning butter it is now commercially made by adding a bacteria to whole, skim, or low fat milk. You can make your own buttermilk by adding 1 1/2 tablespoons of white distilled vinegar, cider vinegar, or lemon juice to 1 1/2 cups (360 ml) of milk. Let stand about 10 minutes at room temperature before using. 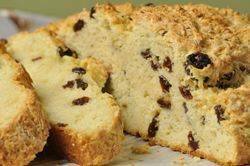 Raisin Soda Bread: Preheat your oven to 375 degrees F (190 degrees C) and place the oven rack in the center of the oven. Line a baking sheet with parchment paper (or lightly butter your baking sheet). In a large bowl, whisk together the flour, sugar, baking soda, and salt. Cut the cold butter into small pieces and blend into the flour mixture, using a pastry blender or two knives, until the mixture looks like coarse crumbs. Stir in the raisins. Make a well in the center of the flour mixture and add most of the buttermilk. With a wooden spoon or spatula (or your hands), mix (adding more buttermilk if necessary) until you have a soft moist dough. Transfer to a lightly floured surface and gently knead the dough into a 7 inch (18 cm) round. Place the round on your prepared baking sheet and then, with a sharp knife, cut a 1/4 inch (.5 cm) deep "X" in the center of the bread. Bake for about 40 - 50 minutes or until nicely browned and a toothpick inserted into the center of the bread comes out clean. You can also test that is fully baked by tapping the bottom of the bread - it should sound hollow. Remove from oven. This bread is wonderful when served warm with butter and/or jam. It also makes great toast. Makes one seven inch (18 cm) round raisin soda bread.